But the link in it's answer is dead, and the file path mentioned doesn't exist in the latest Joomla (version 3.3), so the answer is of no use whatsoever. I don't need to know the user's real name. Everything is required, why bother marking required fields? "Registration failed: Please enter your name." How can I disable the checks for the name field, as well as the two confirm fields? Since a name is required, I'd like to set the name to the provided username (so username and name are the same by default). If the user actually wants to go set a real name in their profile page after registration, they should be able to, but it shouldn't be required. Am I going about this the wrong way? I've read in some places that modifying core Joomla files is not good, as it could break in an update, and that "overrides" should be used instead. Usually these responses simply link to Joomla's page on overrides, and provide no farther explanation about how to use them to do what the asker wants. I've tried to figure them out, but can't, so if overrides are the way to go, please explain how I would go about doing this with them, rather than just linking to the override tutorial. I'd greatly appreciate any help you can provide, I've been trying to figure this out for a few hours now! Ideally, this will all be done in a user plugin. I'm not sure that a lot of people realize this, but you can edit the form from a plugin (no core hack required). Likewise, the plugin will see the input before the model attempts to save the entry, so you can mock some of the field duplication fields to force it to pass the validation. Ok so I was thinking about an approach without having to core hack anything or install any 3rd party extensions. My method will involve a Template Override which you will need to make for the com_users component, specifically the Registration view. I've added in some comments so you know what each snippet of code is doing. A) You can't completely remove certain mandatory fields as it causes problems with data filtering on form submission (see comments in the code below). To combat this, hide rather than remove the fields from the form object. B) The onUserBeforeSave event is not fired until it is too late to prevent the registration validation logic from rejecting the form submission. Instead, use the onUserBeforeDataValidation event. In my particular case, all I wanted was email address and password. Joomla threw in a complication here though, since email address was appearing after password (dictated by the order of the fields declared in the registration.xml file), which would look daft from a user experience perspective. To work around that, I re-labelled the username field to 'Email Address' and instead hid the email address field. 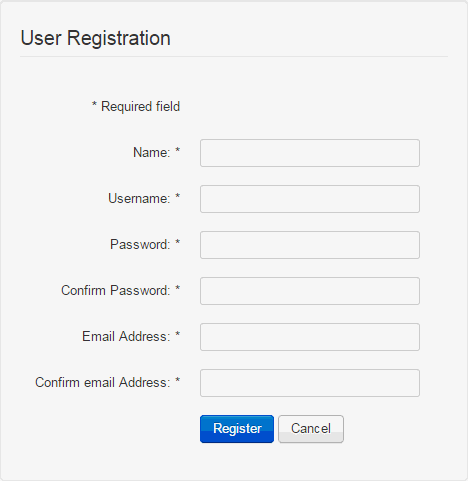 Email is then defaulted from the username on form submission. // which will trip an error from inside the user object itself on save! // Keep up the pretense from above! Not the answer you're looking for? Browse other questions tagged joomla-3.x registration or ask your own question. 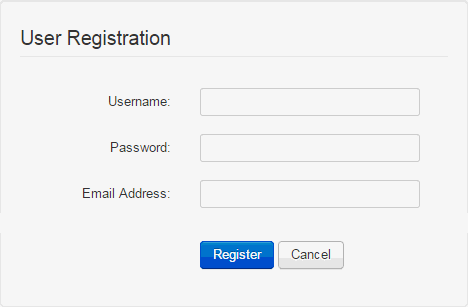 How should I register my users without email address?